The new Ford Mustang is described as performance and refinement personified. For the first time this iconic car has finally come to Europe and Blinding Light were privileged to work with Mansfields Design on the European launch. The event took place over a 4 week period in two specially constructed domes situated in the German countryside where Blinding Light supplied mains distribution, truss, rigging & lighting. 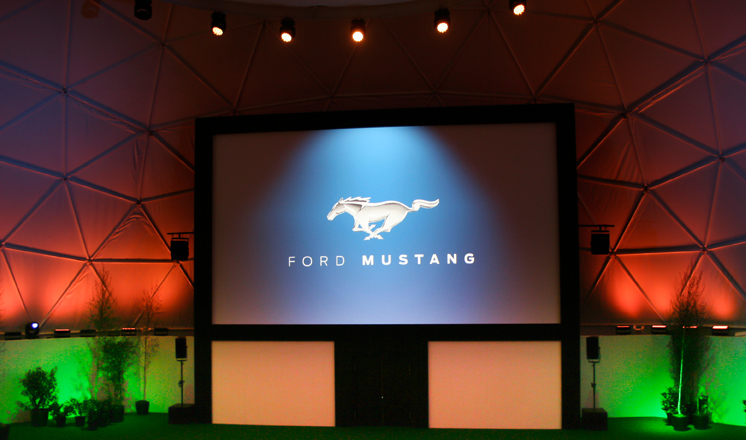 The smaller dome provided an exhibition space where Ford could host a reception and allow guests to network while the larger dome was transformed into a drive-in movie theatre. Blinding Light designed and constructed a ground supported truss system using Litec QX30 & QX40 to house a 10×5.6m projection screen at the front of the theatre. Further ground supported truss structures were installed around the perimeter of the larger dome to allow effect lighting to be rigged evenly around the space. Suspended circular truss structures covered with gauze were used in both domes to reduce sound levels and provide support for effect and house lighting. SGM P5 RGBW wash lights and Source Four Profiles were used in the large dome together with the Clay Paky A.leda K10s to create a dramatic day to night effect once the guests had taken their seats. Additionally custom glass gobos were used in Clay Paky 800 QWOs to project a moon and star effect onto the inside of the dome. Within the dome, discharge floods were used to illuminate and protect the trees & foliage during the 4 week period giving an ambient daylight wash. The design was produced by Blinding Light’s Design Director, Anthony (Turbo) Hall and was programmed on a Chamsys MQ100. A show crew remained on site for the duration, however a laptop controlling the lights could be remotely accessed from the UK in case any of the programming needed altering.